From the very beginning JANITORS had me hooked. It was easy to identify with rather germaphobic Spencer Zumbro, and I loved 'Gullible Gates'. I smiled so hard at their quirks, and laughed every time a predicament came up because of these. 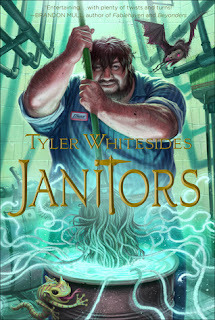 Tyler Whitesides established them as solid characters early on. Later, the Janitors, Marv, Walter, and workers of BEM, were introduced, and their characters were lovable if rather stereotypical. I thought Spencer's mom was so cool, and I liked how towards the end of the book she was involved. This is unusual for a junior fantasy book, but I found it to my taste. I loved his take on school. Far from being a place of study, school is now a battle-zone where every child must fight for survival. Tyler Whitesides' idea of creatures living in classrooms, eating brainwaves, and keeping kids from learning was fun because it added a crazy tweak on everyday scenarios. His magic system and plot points didn't seem to flow as well as they should, but for a debut book it was surprisingly well done. The narration was charming. Simple actions were phrased in such a way that I broke up laughing at several parts. This book has strong under-themes of standing up for what you believe in and stresses that being a good person is the greatest victory one can have.